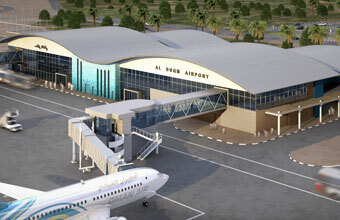 The Tender Committee at the Special Economic Zone Authority at Duqm (SEZAD) awarded the third package of Duqm Airport project, which includes passenger terminal, the 37-metre-high air traffic control (ATC) tower with the control building, air cargo building, firefighting building, airport maintenance and services equipment building, as well as central services building, which includes central cooling unit, generators, power transformers, in addition to setting up of two secondary stations for power generation. The meeting was chaired by Ahmed bin Hassan al Dheeb, Under-Secretary of the Ministry of Commerce and Industry, member of the SEZAD Board of Directors. The award of the third package of Duqm Airport follows the completion of the airport runway and internal roads, as well as other works. The passenger terminal will be built on an area of 5,700 square metres. The initial capacity of the airport will be 500,000 passengers a year. The air cargo terminal will stretch over 8,000 square metres and can handle about 25,000 tonnes of cargo per annum. The committee also awarded a number of tenders related to the development of the zone, the foremost of which include a detailed study for the design of the northern side of the industrial area, which will be done in three stages namely planning and feasibility study, initial design and detailed design. It also awarded the executive works for the main building, the external boundary, the car parking area, the electromechanical connections for the building, the leveling works, the pavement of parking area around the building and landscaping. The committee also awarded a project for the water network at Duqm Port which includes water distribution network, construction of a ground water tank for firefighting and pumping rooms with facilities. It also awarded the consultancy services for the initial design and supervision of the bulk and liquid material terminal and its associated works in Duqm Port, as well as the variation order No 3 for the master plan of roads in Duqm. The SEZAD and the companies wholly-owned by the government and established at the zone were exempted from being governed by the Tender Law according to the Royal Decree No 119/2011 to execute and manage the services and public utilities projects.